A journey through melodic pop is what’s to be expected from this Stockport five-piece, Fuzzy Sun. The freshly formed line-up, fronted by the lulling vocals of Kyle Ross, sees a distinct and original take on chorus-heavy reveries. Daisy Valentines bold and melancholic synth, coupled with sweet and seductive harmonies is equally complemented by Lewis Jobson and Mitch Bancroft’s strong soothing groove through the rhythm section. Fuzzy Sun bring you contemporary pop, infused with psychedelia, dipped in naughties R’n’B nostalgia, with just a hint of disco flare. Fuzzy Sun are signed to Blossoms’ own label ‘Very Cleaver Records’, Fuzzy Sun have been causing waves in and around Manchester with their brand of 80s indie but with a modern twist and with more and more high profile gigs coming up (partly due to the aforementioned signing), word is bound to spread, especially as they have some fantastic tunes so far. At the start of 2014, when their fanbase numbered 200 people in Stockport, counting their mums, and their instrumentation included a decrepit Hammond organ purchased for £5, Blossoms decided to announce their presence to the wider world. Two years on, Blossoms are the biggest noise to come out of Greater Manchester in many years. They have won the approval of Johnny Marr and Ian Brown and, last October, long before there was any sign of a debut album, they sold out the city’s 2,000-capacity Ritz. Their four terrific EPs trace their hurtling development from black turtleneck-wearing psychedelicists to purveyors of chart-bound lysergic pop with big electro riffs and disco basslines, culminating in their forthcoming single At Most a Kiss. Their rise goes against the current grain. The quintet were the only guitar-based band to feature in the influential BBC Sound of 2016 shortlist and one of only two of the longlist’s 15 acts (along with Ripon’s Billie Marten) to come from north of Oxford. The same could be said of their backstory: a mixture of underdog triumph and determined pop romance. Where Brown and John Squire of the Stone Roses famously met in a sandpit as toddlers, Blossoms were all born in the same hospital, Stockport’s Stepping Hill. Ogden met 23-year-old drummer Joe Donovan when they were 13, on a school trip to Alton Towers. Bassist Charlie Salt, 24, and guitarist Josh Dewhurst, 21, entered the same orbit through school and teenage parties in the town. After gravitating together via missteps in other bands, they completed the jigsaw with 21-year-old keyboard player Myles Kellock. Every rejection spurred them on. “For ages, it was like what Decca once told the Beatles: ‘Guitar bands are finished,’” Ogden says. “You just think: ‘Right, we’ll write even better songs.’” Their cramped room in Salt’s grandfather’s scaffolding yard gave them a place to do just that, as well as somewhere to rehearse for free, every day. “We made the video for the first single in there for £60,” Ogden says, pointing to the darkened warehouse. When Donovan met the Smiths drummer Mike Joyce at a Manchester City game, they ended up swapping numbers. Another time, Ogden was surprised to be tapped on the shoulder by Brown. “I said: ‘Hello. I’m Tom from Blossoms.’ He said: ‘I know, mate. That’s why I’m talking to you.’ I was speechless, and then I met Mani. I realised they were just normal, and had done it from nothing just like we have. Ian said that Charlemagne was the best thing we’ve done so far. To hear one of your heroes say something like that is just …” He tails off. The Blossoms sound mixes psychedelia with pop songwriting, 80s pop and Chic, but is definitely their own. The songs began to flow after the end of a relationship Ogden was in and, like Morrissey – a huge influence – he peppers his lyrics with cultural references. Blown Rose quotes the 19th-century Irish poet Felicia Hemans (“The stately homes of England,/How beautiful they stand”), while Madeleine refers to a character in Hitchcock’s Vertigo. If Blossoms make it as big as their heroes, they plan to help their hometown: to reopen the legendary Strawberry Studios, where 10cc, Joy Division, the Smiths, the Stone Roses and Paul McCartney all recorded, and they would like to help the town’s football team, Stockport County. The next time I see the band, they are supporting the Libertines at Manchester Arena and don’t seem out of place on the big stage. • The At Most A Kiss EP is released on 18 February on Virgin EMI/Universal. The band tour the UK throughout February and March. ‘AT MOST A KISS’ – OUR BRAND NEW SINGLE! Rising indie stars and BBC Sound of 2016 hot picks unveil the title track of their new EP, to be released in February. Blossoms, a Stockport five-piece with long hair, leather jackets and guitars, are an indie band, the kind who look, sound and swagger as if emerging bleary-eyed from Koko’s Club NME in 2005. There is, the band have said, more to their sound than straight up guitar rock. 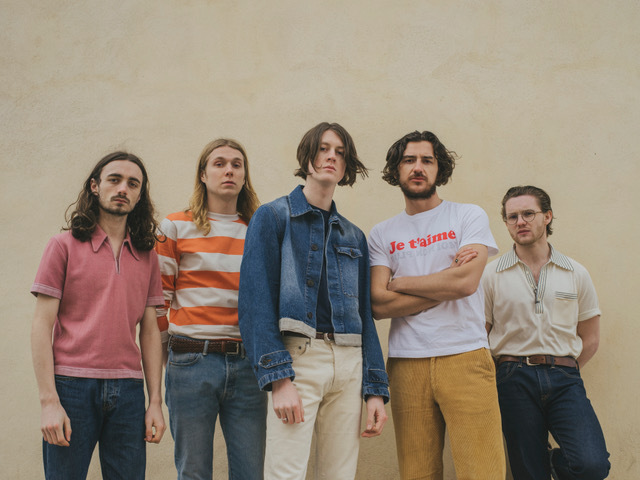 Blossoms admire the music of the Arctic Monkeys and Abba in equal measure, and their new single, At Most A Kiss, is certainly indicative of their love of both buoyant synth melodies, unvarnished glam rock and epic 00s indie pop. Taken from their new EP entitled At Most A Kiss to be released on 19th February, their moody monochrome video for the title track is premiered below.